Mint opened copy with no issues. Import gatefold jacket includes paper OBI banner. Both widescreen AC-3 discs appear very clean. In original plastic sleeve with DD sticker. Both discs mirrorlike in appearance. Cover and included OBI both excellent. Monochrome insert perfect. Comes in original factory vinyl with silver DD sticker on it. A very,very solid 8 rank copy. Always ask for pictures. 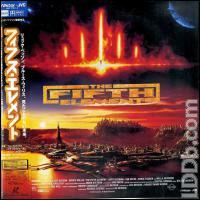 THE FIFTH ELEMENT,JAPANESE RELEASE CIRCA 1998.FINE HAIRLINES/MINOR SCRATCHES,CLEAR/CLEAN. GATEFOLD HAS 2 MINOR CORNER JAMS AT OPENING. INCLUDES OBI/INSERT. VERY GOOD CONDITION ALL CONSIDERED. Very nice gatefold set with OBI and insert. You will not be disappointed. Make me an offer I cannot refuse.